Enjoy all the action from the EFBB’s premier event for the year, THE BRITISH FINALS. Held at the Wembley Conference Centre, London, see all of the exciting contest action with posing from the top competitors, all the posedowns and awards. 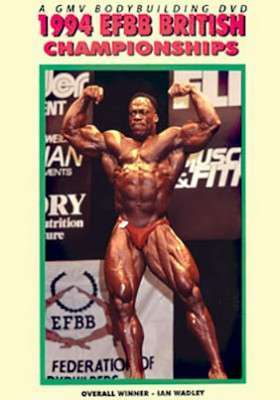 1994 EFBB British Championships: Finals – Men & Women. Enjoy all the action from the EFBB’s premier event for the year, THE BRITISH FINALS. Held at the Wembley Conference Centre, London, see all of the exciting contest action. Includes posing from the top competitors, all the posedowns and awards. Highlight of the event for many was the appearance of STAR GUEST POSER and Britain’s own current Mr Olympia, DORIAN YATES. This event was very close to the Mr Olympia and accordingly you get to see Dorian in his Mr Olympia condition. The Muscle Mountain – IAN WADLEY crushed his opposition in the heavyweight class. He went on to win the overall-posedown in front of a capacity crowd. COLLEEN YATES won the Overall Women’s Championship. She defeated BEV HAHN in her own class and then the other class winners LOHANI ROCHI and SARAH WESSENDORF. Men’s Class Winners: IAN WADLEY, ROB WALL, PAUL THOMAS, DAVE FORD. Women’s Class Winners: COLLEEN YATES, LOHANI ROCHI, SARAH WESSENDORF. Overall Winners: IAN WADLEY & COLLEEN YATES. Special guest poser – DORIAN YATES.